Of course, I painted and panel-lined mine (after all, I have to get use out of the bucket-load of Gundam markers I bought last time I went to Japan), but the whole build didn’t take too long. Total build time from box to finish was probably around 10 hours (though admittedly with a year’s gap between clipping the parts and actually building the thing!). I’m impressed with the finished model, and especially the poseability. The new ball joints they’ve incorporated give the shoulders, legs and head much more flexibility than previous 1/144 scale kits. 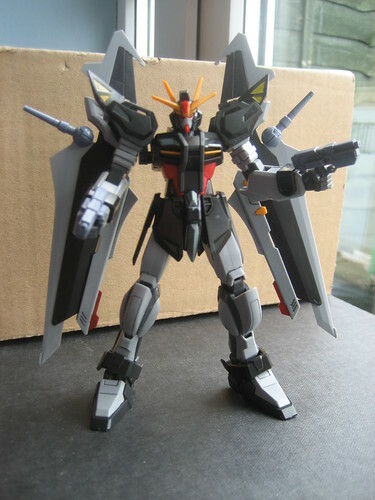 That’s good, because the abundance of weaponry on the Strike Noir — wing backpack, dual pistols, beam swords doubling up as foldaway cannons — allow for a lot of posing fun. It also comes with a matching display stand (though I’ve since pilfered it for my 1/144 Strike Freedom instead :p). Overall, this was a fun, quick kit to build and good to do something quick for a change. Fine if you just want something satisfactory, but if it’s the Gundam and quality you’re bothered about, it’s worth pointing out that the Strike Noir is now available as a 1/100 MG version. I’m trying to stick to MG and upwards kits from here on, as the quality is soooo much better! The next time I read a web-site, I hope that it doesnt disappoint me as very much as this one. I imply, I know it was my selection to read, but I really believed youd have some thing intriguing to say. All I hear is often a bunch of whining about one thing which you could fix for those who werent too busy searching for attention.